What were my ‘aha’ moments during the recent Transformations 2015 conference in Stockholm? 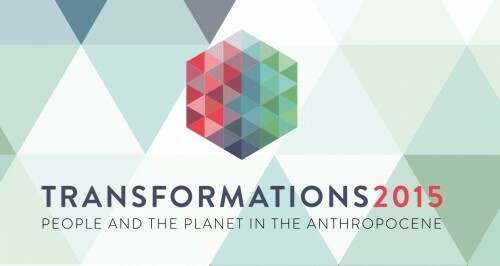 I was asked to reflect on these during the closing plenary of a three-day conference on “People and Planet in the Anthropocene.” As a follow-up to the Oslo conference in 2013, Transformations 2015 brought together 250 researchers and practitioners for deep and dynamic conversations about what transformation means, how they come about, and why they matter. There was no shortage of inspiring moments at the conference. For example, in a plenary talk about complex patterns of rice cultivation in Bali, Stephen Lansing of the Complexity Institute mentioned that it was during one single conversation that he suddenly understood the patterns and realized that many small systems seem to self-organize and operate as one optimal system. Self-organization, he emphasized, does not happen automatically, but instead is a result of continuous adaptations by farmers. This suggests that many patterns may be less random than we assume. How many similar transformations are taking place, hidden from or invisible to planners and policymakers? I found this research fascinating. However, my biggest ‘aha’ moment of the conference was not about self-organizing systems, but about the significance of ‘aha’ moments. ‘Aha’ moments refer to flashes of insight that occur when we suddenly see things from a new perspective. Patterns and processes that were invisible suddenly become visible, changing the way that we make meaning of the world. A single conversation can trigger a single thought that changes everything. ‘Aha’ moments often reveal new possibilities and potentials, and sometimes even new solutions. In many cases these possibilities and potentials have been there all along, waiting to be recognized. However, they can also emerge through committed and active engagement with a particular issue and the dynamic interactions that result from this. It is easy to dismiss or ignore the significance of these moments in our busy lives, where we tend to move on from one thought or activity to the next one with little time for reflection. Yet if we underestimate the power of ‘aha’ moments, we may be underestimating our collective capacity for transformation. In fact, these small moments may be the ones that actually transform us and our world. There are several reasons to take ‘aha’ moments seriously. First, such moments may occur more frequently than we recognize. If we listen and pay close attention to their signals, whether it is a shiver, goosebumps, a wave of recognition, or an experience of profound ‘knowing’, we might notice that these instances occur quite regularly, especially when we are in conversations or dialogues with others. Second, such moments may be more powerful than we assume. When we catch even a small glimpse of the world from a different perspective, rigid beliefs and deep assumptions may lose their grip over us, and paradigms may begin to change. Knowing that our views are partial and incomplete can be a powerful catalyst for transformation. Finally, ‘aha’ moments are usually shared with others. Connections are made and collaborations are generated through shared insights. New thoughts create ripple effects across space and time, giving rise to new possibilities and potentials that can influence collective worldviews. Can we create more ‘aha’ moments through practice? Can they be catalyzed through listening, learning and sharing? Transformations in practice will be the theme of Transformations 2017 in Dundee, Scotland, and there is no doubt that this conference will generate new ‘aha’ moments. In the meantime, we may want to pay attention to the *aha* moments that occur and unfold every day, contributing to hidden transformations that can change the world.